The Doctor takes Romana for a holiday in Paris – a city which, like a fine wine, has a bouquet all its own. Especially if you visit during one of the vintage years. But the TARDIS takes them to 1979, a table-wine year, a year whose vintage is soured by cracks – not in their wine glasses but in the very fabric of time itself. But then, the Doctor’s holidays tend to turn out a bit like this. 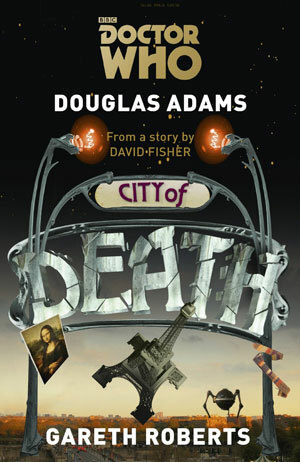 Featuring the Fourth Doctor as played by Tom Baker, City of Death is a novel by Gareth Roberts based on the 1979 Doctor Who story written by Douglas Adams under the pen-name David Agnew. City of Death is one of the best-loved serials in the show’s 50-year history and was watched by over 16 million viewers when first broadcast. The book is available to pre order now from Amazon at this link: http://www.amazon.co.uk/gp/product/1849906750/ref=as_li_qf_sp_asin_il_tl?ie=UTF8&camp=1634&creative=6738&creativeASIN=1849906750&linkCode=as2&tag=charbuiltoys-21 and Waterstones from here: http://www.waterstones.com/waterstonesweb/products/douglas+adams/gareth+roberts/doctor+who3a+city+of+death/10097083/ The book will be released on the 3rd of July 2014.